There are 3 separate Assembly Packages listed on the MSRP Pricing Sheet and detailed below. These are intended to supply the hobbyist builder with all of the required parts and assemblies to complete a BECK SPEEDSTER ® "Deluxe Pre-Assembled Body Package" into a "Roller Package" without hunting hardware or additional parts. These packages provide several advantages. By providing all of the hardware and assemblies listed the builder can save time and money. No need to run all over town to hunt down a VW brake clip, or a metric bolt that costs a dollar, but is not at your local parts house. Having all of the proper size and grade of hardware, all of the brightwork and trim, and all of the associated suspension pieces these packages are money well spent. You save time and money. We are assured that the proper hardware will be on the car for a safe, quality build. Win/win. This Brightwork Package pictured below contains: A pair of headlight assemblies with bulbs, gaskets and hardware, 2 Front Turn Lights w/ bulbs, 2 Chrome Horn Grills, a pair of Rear Tail lights w/ red lenses, bulbs and mount hardware, a Shine-up License Plate Light Assembly with lic. plate bracket, a Drivers side Aero Style mirror, a rear view mirror w/ mount, 2 wiper blades and arms. All of these parts are ready to install. Separately these items cost about $1100.00. Note: Hubcaps and body side moldings now sold separately.. 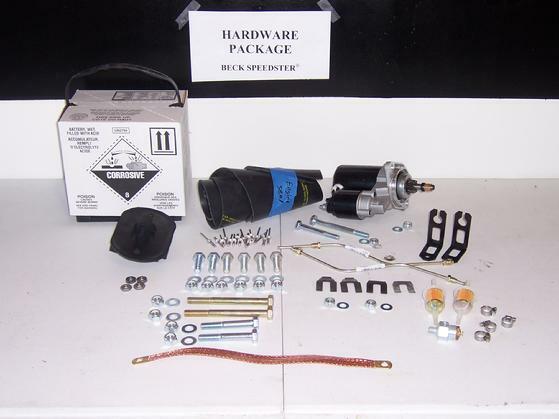 This Hardware Package includes a 12V starter motor w/ hardware, a 12V DEKA battery, the rubber engine seal w/ rivets, front and rear transmission mounts w/ hardware, all required engine mounting nuts and bolts, brake clips, short rear brake lines and brackets, a ground strap, all hardware to install your transaxle to the spring plates, 2 fuel filters w/ clamps. If purchased separately is over $500.00.